To explain how I discovered the Best Sandwich Cookie Probably Ever, I must begin with soccer. The World Cup is kind of a big deal. I’ll be honest; I’m not exactly what you’d call a sports fan. But hey hey, any excuse for a party, am I right? 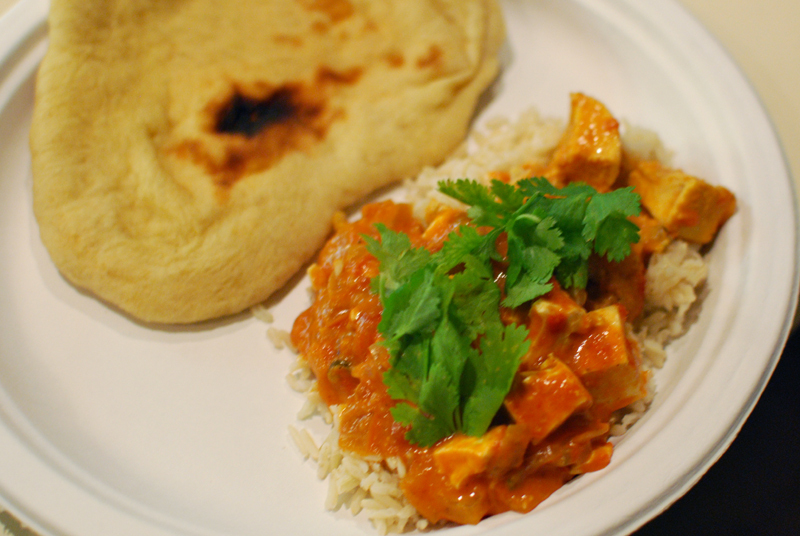 So when one of my dear friends solicited culinary assistance for his month-long World Cup extravaganza, I said “yes”. After all, this is the screen he’s got set up in his living room. That’s 220 ever-lovin’ inches of hi-definition soccer action, people. How could I refuse? As for the food, we decided to focus on the US games, offering food that would acknowledge the two nations battling it out on the pitch. 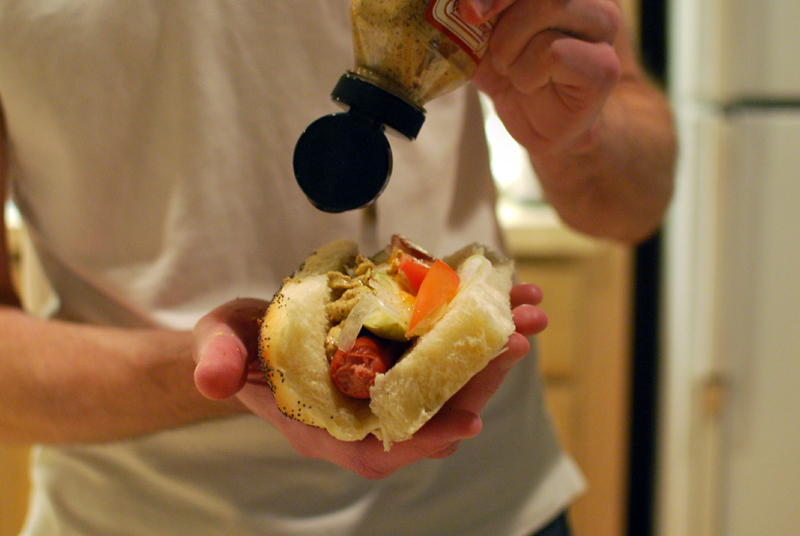 For the first US game this last Saturday, against England, I prepared Chicago-style hot dogs to represent America, matched against Britain’s national dish, Tikka Masala. Known as alfajores (al-fuh-HOR-ehs), their exact nature was a bit tricky to pin down. 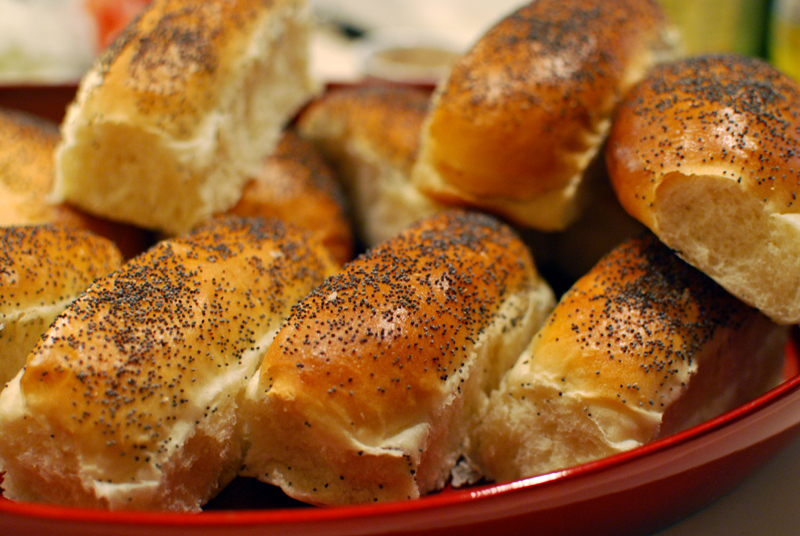 Made with a significant amount of cornstarch (or none at all), the dough is rolled out and cut into rounds (or just dropped onto a baking sheet). The baked cookies are sandwiched together with dulce de leche (or jam, or chocolate), and coated with powdered sugar (or chocolate, or nothing at all). Really, the only consistency between recipes is the act of sandwiching the cookies; other than that, it’s all up to the whim of the chef. The beauty of cookies this variable and this obscure is manifold; if no one knows what they’re supposed to be like, then you can’t possibly mess them up. Were they authentic? Possibly. Were they good? Oh, my, yes. Meltingly tender and crumbly in texture, the subtle and lightly buttery flavor of the cookies themselves was matched gorgeously by the relative robustness of the dulce de leche in between. The high percentage of cornstarch in the cookie dough made for a silken feel on the palate, while the sticky dulce de leche lingered just long enough to remind you of a chewy caramel. I made over 50 of these sandwich cookies, and the dozen or so party guests (including myself) finished them all off. Every last one. They were the only things to go; there were nearly enough tikka masala and Chicago dog leftovers to throw the same party all over again. I believe one or two lamentations were gently wailed when it was discovered that the alfajores were gone. Stay tuned for more World Cup recipes; the second US game happens today, but, over plenty of American and Slovenian food, we’ll be watching it on repeat later tonight. Yes, all 220 glorious, hi-def inches of it. The high percentage of cornstarch in this dough means that you don’t have to worry nearly so much about toughening from over-rolling. I re-rolled scraps three times (! ), and the cookies still turned out well. Try to find an organic cornstarch for this (or at least as high quality as you can find), as butter will only go so far in covering up off flavors. Be gentle when sandwiching the cookies together, as the crumbly, shortbready texture can lead to much breakage. I used a can of prepared dulce de leche, but if you prefer to make your own, try David Lebovitz’s simple recipe. 1. Whisk together the cornstarch, flour, baking powder, baking soda, and salt in a medium bowl. Set aside. 2. In the bowl of a stand mixer, beat the room-temperature butter with the paddle attachment on medium speed until smooth, about 30 seconds. Add the brown sugar and cream for 3 minutes on medium speed until fluffy and light, about 3 minutes. Add the egg yolks one at a time, beating until each has incorporated, scraping the bowl as needed. Add the rum and vanilla, and beat until mixed in. 3. Add the cornstarch mixture, and mix at the lowest speed until just incorporated, 30 to 60 seconds. 4. Turn the dough out onto a work surface sprinkled lightly with flour. Knead gently two or three times, if needed, and divide into two even halves. Shape each half into a disc, wrap tightly with plastic wrap, and refrigerate for at least 1 hour and up to 12 hours. 5. Preheat the oven to 350º F. Line two large baking sheets with parchment paper, or lightly flour. 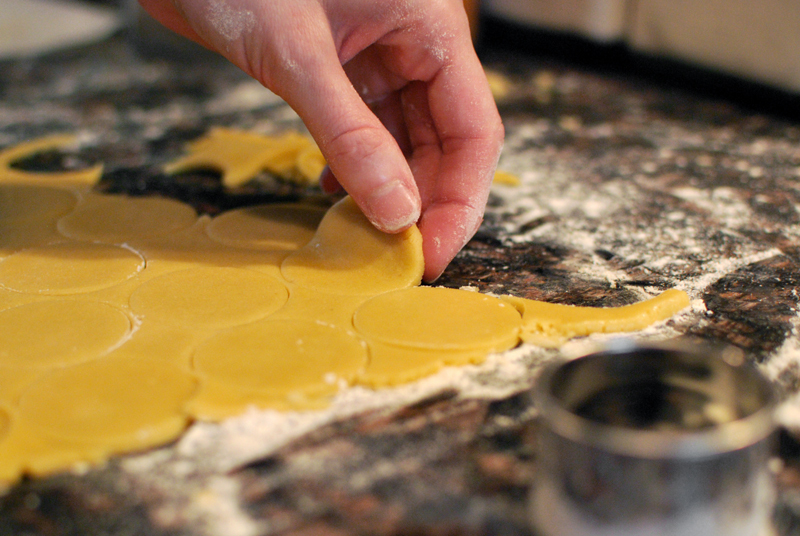 Remove one piece of dough from the refrigerator, and let stand at room temperature for 10 minutes before rolling. 6. Dust a work surface lightly with flour. Roll dough to a thickness of 1/4 inch, dusting with additional flour as needed to prevent sticking. Using a 1 1/2 inch to 2 inch round cutter, cut out rounds of dough as closely together as possible. 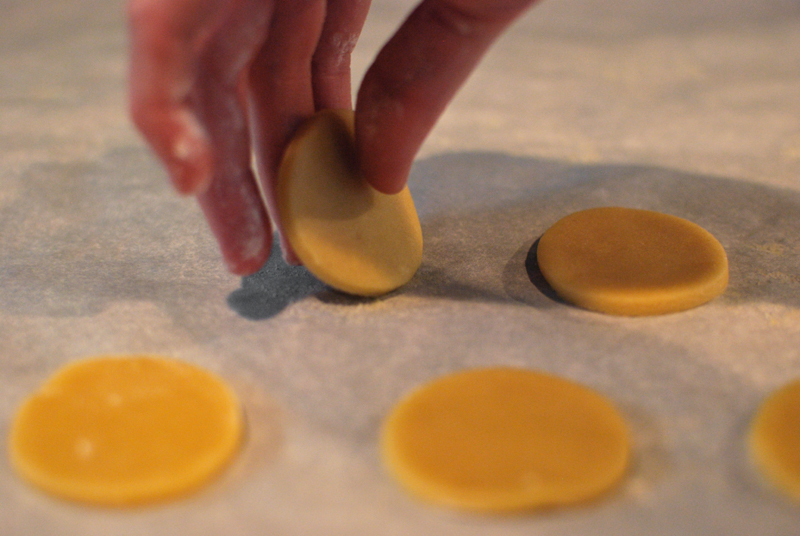 Place rounds on the prepared baking sheet, spacing at least 3/4 inch apart. Gather scraps, knead together gently, wrap again in plastic wrap and refrigerate. 7. 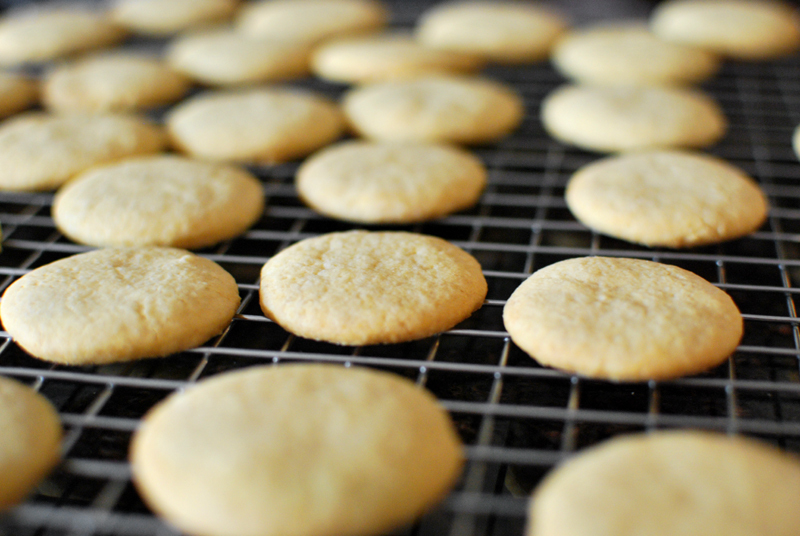 Bake cookies at 350º F for 8 to 11 minutes, or until just beginning to color on the edges. Let cool slightly on the pan before removing to a rack to cool completely. Repeat rolling, cutting, and baking with remaining dough, saving all scraps to knead together and roll out at one time. 8. 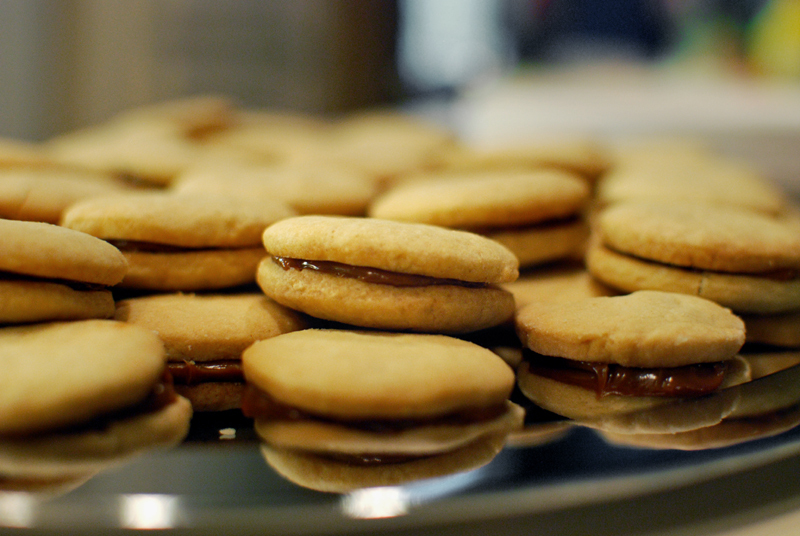 To finish cookies, spread a slight amount of dulce de leche (1 to 2 teaspoons) on the underside of one cookie. Very gently press a second cookie on top of the dulce de leche. Repeat with remaining cookies. 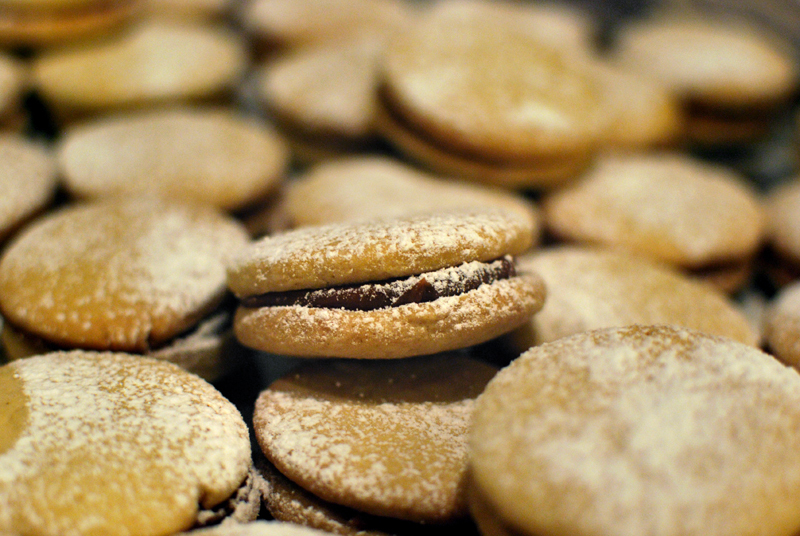 Sift powdered sugar over the tops of the sandwiched cookies to finish. Serve within 1 day.